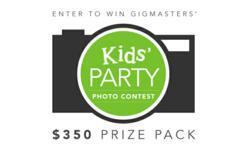 GigMasters.com, the #1 event entertainment booking service announces its “Kids’ Party Photo Contest.” Parents, relatives and friends are invited to share their favorite kids’ party photo by submitting it for entry. The photo with the most votes on Facebook will win a $350 kids’ party prize pack. 1. Party Entertainment: Does your next kids’ party need a clown or magician? How about a costumed character or a bounce house? The choice is yours when you receive a $200 credit on GigMasters, to be applied towards booking your choice of entertainment for your next kids’ party. 2. Delightful Decorations: Every party needs fabulous decorations. That’s why you will receive a $100 gift card to Oriental Trading. Shop online and find the perfect party supplies for your next event. 3. Party Printables: Custom invitations and hand crafted party printables will instantly add special style to your party. With a $50 gift certificate to the Piggy Bank Parties Shop, you'll be able to select fun printables for your next party. To enter, contestants simply need to submit their favorite kids’ party photo by uploading the picture to Facebook and tagging GigMasters: http://www.facebook.com/gigmasters or by pasting the image URL into the comments of the contest blog post. For the complete list of prizes, rules and regulations visit: Kids’ Party Photo Contest. GigMasters is the number one event entertainment booking service, guiding party planners and hosts to the right entertainment for every event. By combining the efficiency of the web with the personal touch of a private event planner, GigMasters has helped facilitate more than 160,000 bookings. With the Internet's largest nationwide database of client-rated entertainers for live music and variety entertainment, GigMasters boasts 10,000 performers including live bands, DJs, wedding musicians, celebrity impersonators, balloon twisters, stand-up comedians, jazz trios, bagpipers, string quartets, soloists and more. The site, founded in 1997 by Kevin Kinyon and Michael Caldwell, attracts over 30,000 daily visits throughout North America. GigMasters is a proud member of the Better Business Bureau, TRUSTe, and is also a DigiCert secured website. For more information, please visit http://www.gigmasters.com.